evin has been teaching himself the skills required to make objects from cold steel and fire with some help from the University of YouTube. Of course, as I think everyone knows, the most basic equipment he needs is a forge, an anvil, metal-working tongs and an assortment of hammers. Anvils are surprisingly expensive so we bought this damaged second-hand one that we found for sale. As you can see in the photos, the anvil was dropped resulting in the hanging end or heel (technical terms alert!) breaking off (see main image) and giving it a nasty crack (left). In order to use an anvil, it must be mounted on something secure and at the right height for the work you wish to do. Tree stumps are often used for this but we don’t have any tree stumps just lying around. Therefore, Kevin and Louis made a stand out of some scrap wood and securely chained the anvil to it. Now that it is secure, work could begin on the repairs. Kevin decided to repair the anvil by slicing off the damaged sections and welding on a new heel and top face in its position. He began by cutting off 5mm of the anvil in the face with the crack. As an anvil is made out of hardenened steel it took him close to two hours to remove it! He cut slots, 5mm deep, in order to divide the damaged face into workable sections. From there he was able to cut off each strip one-by-one. There wasn’t much left of his cutting disk after all that! After polishing the face smooth and filling in the remainder of the crack by welding it closed, this side is now ready for its new face. Fun Fact: You probably know that the strength of steel is dependent on the size of the piece of metal’s crystal structure that forms as it cools down. I always thought that this was on such a tiny molecular level you wouldn’t be able to see this with your eyes. But this anvil has proved me wrong! This hardened steel anvil has large crystals which you can see by the grainy texture on the inside of the anvil where the heel broke off! 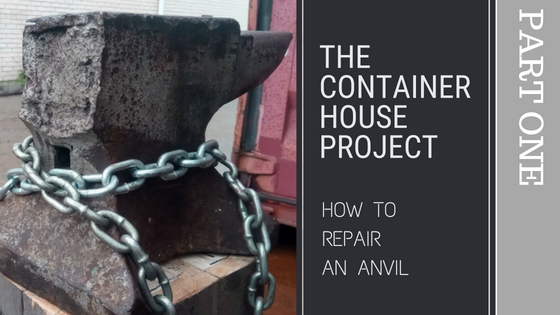 The anvil’s new heel started off as a rectangular block with a round hole in it. It needs to be a tapered block with a square hole which is the hardy hole (another technical term!). The first problem is easily solved by cutting a wedge off the corner and welding it in a new position. Kevin made sure that he made multiple passes while welding in order to build up the new material evenly and make sure that there are no air spaces. Turning a round hole into a square hole is a little more complicated. But, Kevin knew exactly how to accomplish that. He welded some handles onto the new heel block and fired up the forge. Isn’t this the most amazing colour? A piece of hardened square bar and a heavy hammer will do the rest. With the hammer, he used the square bar to punch through the round hole and thereby create a square hole. It took some time, with many whacks with the hammer, and Kevin had to reheat the work piece seven times. And there you are: A new anvil heel with a hardy hole. Fun Fact: The square hole is called a Hardy Hole. You use it to mount tools to the anvil so that you can use the tools and still keep your hands free for the metal. Read more here. Now all that is left is to assemble all pieces. In order to honour the time-old tradition of suspense, we’ve decided to break this post into two parts. We’ll post some more photos detailing the rest of the repairs soon, so don’t forget to visit us again. In the meantime, please leave a comment and let us know if you’ve ever seen a real live anvil. It’s not something you see everyday anymore. Never seen a real live anvil – only ever heard about them in tales of Medieval times and had no idea that they were still in use today. Kevin is very clever to know/learn how to do all that. There’s quite a revival in old skills so we might perhaps see these things more often again as time goes on. Indeed. It’s taken Kevin a good couple of weeks to finish all the work in his spare time. I agree that childhood seems like a long time ago in a distant land.